Melissa’s Record, Medal and Euro Selection! 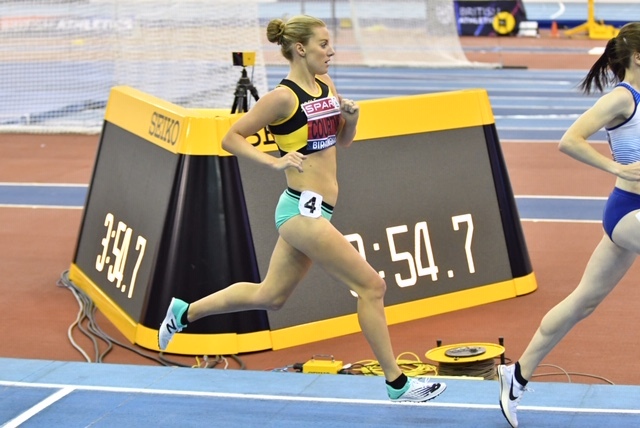 At the IAAF World Indoor Tour meeting in Karlsruhe, Germany, on February 2nd, Melissa Courtney won the W3000m in a new Welsh Indoor Record of 8-43.36. Also in the race were athletes from Ethiopia, Germany, Netherlands, Spain and France. This acted as a warm-up for the Spar British Championships W3000m race at the NIA in Birmingham last Saturday. Enthusiastically watched by about twenty spectators from Poole AC (with flag! ), the race had a pace-maker who led until just 400m from home! Eventual winner, Laura Muir, made a break, closely followed by Millie. Laura sprinted 56.9 for the last 400m, clocking 8-48.02. By being runner-up (silver medallist!) in 8-50.61, Millie achieved her goal of automatic selection for the Euro Indoor Meeting. This will be staged at the Emirates Arena in Glasgow from March 1st – 3rd. The W3000m final is due at 9.40 pm on the first night. Go well, Millie! In the MLJ, Jack Roach (son of Mark) was close to his SB, finishing 7th/10 with a best of 7.36m. Remember, the first two (if with qualifying standard) go to Glasgow! Of other local athletes competing in Birmingham, James Lelliott (BAC) was 2nd in MLJ, Piers Copeland (WAC) was 3rd in M1500m and Ryan Webb (WAC) was 4th in MHJ. Only two juniors ran at Dibden in wet, muddy conditions. Ten seniors finished, the outstanding individual performance coming from Jamie Grose at 4th of the 194 runners in the SM. The SM are in Division 1 (of 3), finished 9th/9 on the day and are 8th/10 on aggregate. The SW finished 19th/20 on the day and 16th/18 on aggregate. Best team aggregating their best 4 results for the season were the u15B by being ranked 4th/11 clubs. The only individual ranking in top 10 on aggregate is Dave Hicks, at 5th in the Vet Men. The team result for the VM was 19th/19 on the day; their aggregate ranking was 7th/19 clubs.